President Moon Jae-in and Prime Minister Narendra Modi sign 11 agreements to double trade by 2030 in the areas of railways, healthcare, telecommunications and cybersecurity. The two nations are also keen to explore a tripartite partnership for development. India and South Korea signed 11 agreements on Tuesday to expand business ties and more than double mutual trade to $50 billion by 2030, a day after the premiers of the two countries launched a Samsung mobile phone factory near Delhi. Major South Korean companies including Samsung and Hyundai Motor Co are household names across India, one of the world's fastest-growing markets, and visiting South Korean President Moon Jae-in said he hoped that smaller companies from his country could replicate that success. 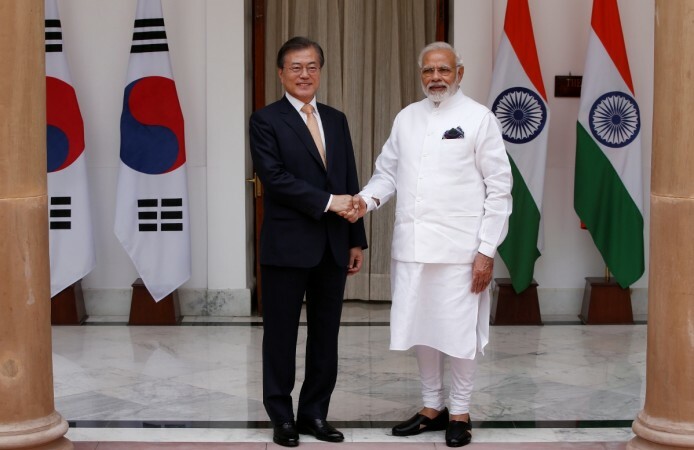 "Going forward I hope that more Korean companies will invest in India so that the foundation for mutual prosperity can be further expanded," Moon said after meeting Prime Minister Narendra Modi on the third day of his four-day visit. Bilateral trade between the world's seventh and 11th largest economies rose by nearly a quarter to $20.8 billion in the 2017/18 fiscal year that ended in March, with $16.4 billion of that in favour of South Korea. The agreements signed between the countries included accelerating negotiations to upgrade a 'comprehensive economic partnership agreement' signed in 2009, as well as expand cooperation in railways, healthcare, telecommunications and cybersecurity. They also agreed to explore a tripartite partnership for development in third countries, beginning with capacity building programmes in Afghanistan. India already has close ties with Afghanistan and is helping to rebuild the war-ravaged country. 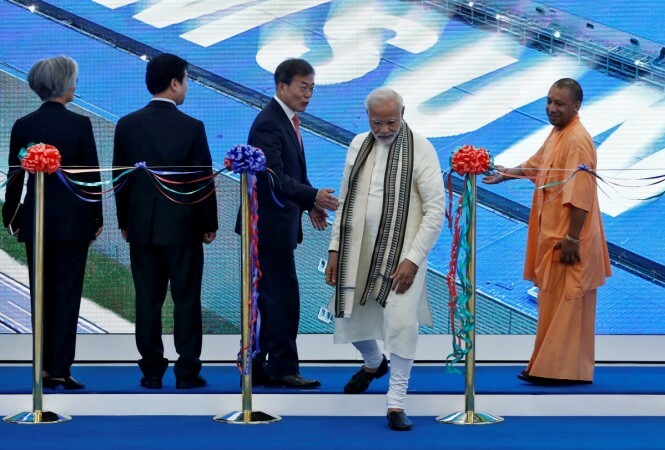 Moon and Modi on Monday formally opened a new Samsung factory on the outskirts of Delhi which the company called the world's biggest mobile phone manufacturing plant. The plant's inauguration comes at a time when Modi, who faces an election next year, is trying to create new jobs for millions of Indians who join the workforce every year. In an apparent endorsement of Modi's electoral prospects, Moon said he would eagerly await the Indian leader's visit to South Korea in 2020. Modi, in turn, credited Moon for South Korea's peace breakthrough with North Korea and offered India's support in taking that forward.